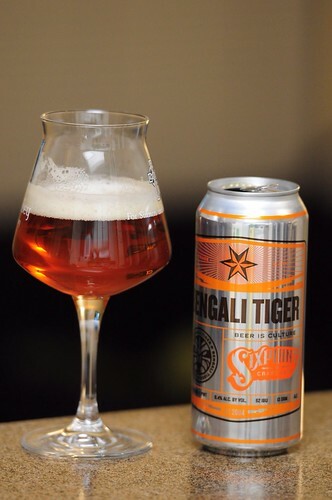 Six Point Bengali Tiger, originally uploaded by adambarhan. A: The beer pours a cloudy light amber color with a huge white head that sticks to the glass. S: Mostly bread and pale malts with just a hint of floral hops and maybe some tea, touch of hops. Just a little bit of citrus peel and that’s about it. T: The flavor is simple and easy to drink. There is a light bitterness and just a bit of grassy and floral hops. Mild citrus peel notes and a little bit of tea here, too. M: Medium in body with the carbonation just on the low side of medium.